When you donate to John Paul II Center you’re not just supplying our students with books and materials, you’re providing a means for them to write their own stories and find their voices. When Angel first came to John Paul II Center (JPII) six years ago, he was a quiet, frustrated 15 year old. Many of his former teachers and aides told his mom, Leonelly, that he would likely never speak. Using positive modeling techniques, JPII teachers worked with Angel until he slowly began speaking. With each new word, his attitude and self-confidence improved. He could express his feelings and ask for what he wanted. He began socializing and making friends! When Angel found his voice, Leonelly saw him transform into a smart, caring young man who wants to give back and help others. At one point, Angel’s family had an opportunity that would have them moving away from Reading, but Leonelly knew that Angel found his happiness at JPII and wanted to allow him to continue his learning in a safe and positive environment. 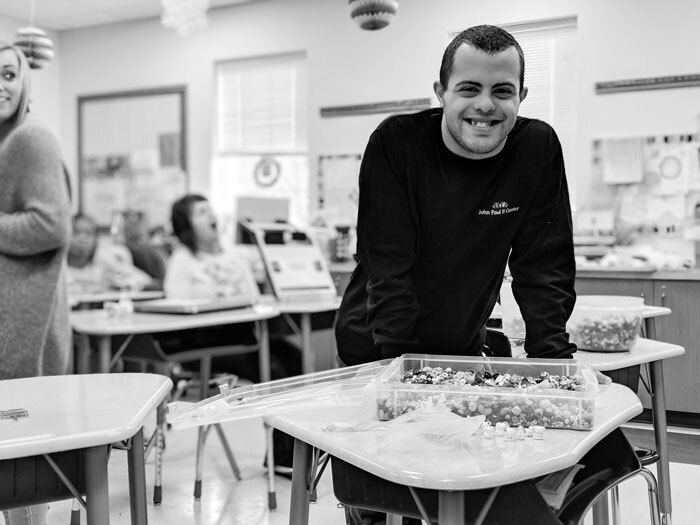 Now entering his final year of school, Angel continues to receive speech therapy and is ready for the next step in his journey. He and his mother love knowing that JPII is available to help others in need. To help our students and adults find their voices, write their own stories, and continue on their journeys, we hope you will consider making a gift to this year’s Annual Fund. Your support truly makes a difference in the lives of these special children and adults.